Arriving in Portland Friday evening we drove straight to the Painted Lady, with a brief stop along the way to pick up some wines from the cellar. The small and charming room was lit with candles and magnums of local Pinot Noir from the Willamette Valley’s top producers lined the walls. We were greeted with an amuse bouche, a white bean puree with fried capers, cardamom served with thin cheese wafers and capers. Two whites served as our aperitifs and for pairing. FX Pichler’s 2002 M Gruner Veltliner was stunning. A bouquet of dried flowers and white pepper jumps from the glass. On the palate, a complex experience of stone fruits like nectarine and lichee, a hint of legume in the background, and roses. Round yet totally dry on the finish. This paired well with the root vegetable bisque with smoked trout and crème fraiche. As did the second wine, a half bottle of Domaine Weinbach 2004 Riesling Cuvee Catherine L’ENEDIT. This lived up to its name, the finish was indeed endless. In contrast to the Pichler, this was a step up in richness. Exotic nose of peach nectar, passionfruit, elderflower syrup. Completely seductive, luscious, a roundness on the palate yet finishing completely dry with baking spices. Delicious. The third wine was a transition to red and was paired with an excellently prepared stuffed quail. The Meo Camuzet 1996 Clos Vogeot, was tightly wound showing years of potential development with continued cellarage. That being said, it was lovely to drink now. An explosive nose of wild game, herbs, forest floor, wild berries, and a touch of beef steak aromas. On the palate, rich fruit profile featuring black cherries, asian spice, and a velvet like texture. Elegant. The finish displays a touch of drying tannins though not at all bitter. A trio of chocolate for dessert was incredibly rich and made us quickly forget about a disappointing bottle of Chateau Monbousquet 2000 (corked!). House made toasted marshmallows were dipped in a chocolate soup and the two other chocolate presentations were embarrassingly decadent. This dessert should have come with its own cardiologist standing by! 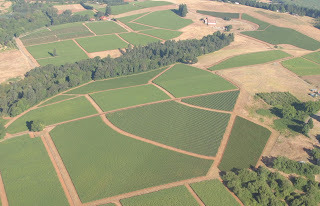 Saturday was a pre-Valentine’s Day lineup of wineries in the Willamette Valley that opened their doors to the public. 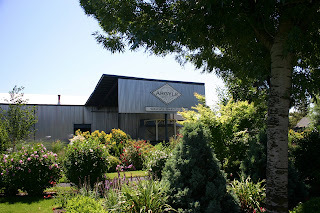 The first stop was Sokol Blosser, which had a wine flight for the occasion. Different styles of chocolate lined the counter and a packed crowd of tasters lined up to sample the diverse tastes. Bittersweet chocolate, chocolate with chilli peppers, and other crumbles were set in bowls. The first wine was a Sokol Blosser 2000 Pinot Noir Willamette Valley, out of magnum. Typical of the vintage it was featuring more earth than fruit, though there were berries and violets in the glass. A simple wine, it nonetheless washed down our chocolate crumbles to great effect. 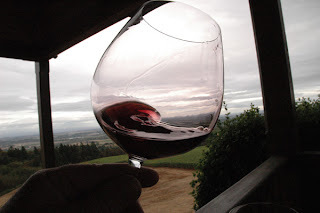 A 2004 Dundee Hills Pinot Noir was more full bodied and ‘New World’ by comparison, again typical of the vintage in Oregon. Bing cherry, cola, and chocolate. Definitely more fruit than the 2000. This was followed by the latest vintage, the 2005 Dundee Hills Pinot Noir. Seemed to be a balance taking characterists of the 2000 and the 2004, not as silky and fruit forward as the 2004 yet not the ‘Earth Bomb” the 2000 seemed to be. My Wine of the Flight, mushrooms and raspberries, some tannic backbone and a mocha finish. The Medetrina IV (fourth year of production, no vintage is displayed) is the bistro wine of Sokol Blosser, a blend of Pinot Noir, Zinfandel, and Syrah. Juicy, fruity, a simple wine yet perfect for BBQ. I found the last wine, the 2006 Estate White Riesling Dessert Wine, to be a touch cloying for my palate. They recommend pairing with Gorgonzola and I can see that would work nicely. It is luscious, but the best part as far as I’m concerned is the packaging. The marketing department at Sokol Blosser is in top form I think they could sell ice to eskimos. The last stop for the day! Though Soter makes a nice sparkling wine (love the rose), Argyle rules in Oregon when it comes to the bubbly, the brainchild of winemaker Rollin Soles. The farmhouse like tasting room was a little less jam packed as we were some of the last tasters of the day. A white cat was passed out on a couch with White House dinner menus lining the walls, all featured an Argyle wine as a pairing for those state dinners. I did not take notes on those except for my favorite sparkler of the day, the 1999 Argyle Knudsen Vineyard Brut. Brioche, poached pears, and a great texture on the palate, this is a fantastic wine. Great balance! Next week we will post about the La Paulee event happening in San Francisco....Can't wait!